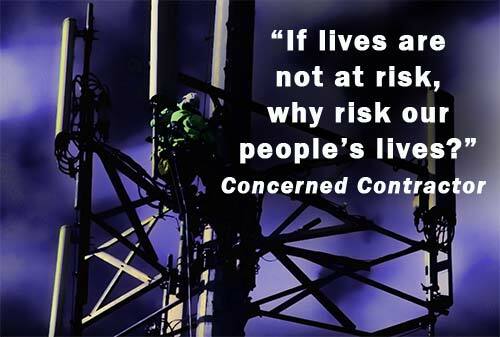 “It’s obvious, carriers are simply putting profits ahead of tower technicians’ lives,” said a Texas-based contractor’s safety manager last week, deploring requirements by some carriers to perform maintenance work during nighttime hours to keep subscriber service interruptions at a minimum. He was one of many company owners and safety professionals Wireless Estimator spoke with after there was a groundswell of concern following what appears to be the industry’s first fatality during a nighttime climb that occurred on Jan. 10, 2019 in South Dakota. Although OSHA is investigating the accident, it will never be known if nighttime work was a possible causation for his death. Even if the deceased might have transitioned without being 100% tied off, although there is no evidence of that occurring at this time, limited visibility could have contributed to what might have been perceived compliance. “Depending upon how dark it was, there’s a possibility that he could have thought he was hooked in at a proper tie-off, but wasn’t,” said one company’s safety director who had previously climbed for over 12 years. “Verizon does at times request night work on the tower, but I tell them that our company policy is that no night work will be performed on a tower. I don’t want to put our guys in that situation especially in the winter months or even the summer months. The only night work we perform for carriers is ground based,” said a contractor. Seven others provided similar statements, although three of them said they will do night work if it’s a public safety or critical infrastructure emergency. Although carriers provide the bulk of work to the industry, broadcasters will also require night work maintenance. “What we typically would do is prebuild the site, climb and light the tower. Then go in at night to do the work. The issue is lighting is never as good as natural light, so there are shadows and shadows are not friendly to tower climbers. You need to know what you are going to grab, where the load is and where you are going to put your feet and safety straps,” said one contractor. Contractors will agree that night work is inherently slower and carriers don’t want to pay additional for the work, even though it takes quite a bit longer. They also point out the issue of worker fatigue. “In some instances, techs typically work a full six-to-eight hours to prep, then will get dinner, maybe a quick nap, and then return around 11:00 p.m. and work another six-to-seven hours,” said a northeast contractor. “We just refuse to do that as it causes worker burnout and when we push back, we typically offer a regular cutover procedure that can be done during the day. If the prep work is done properly, the outages are usually short,” said one contractor offering a solution to night work. “Unfortunately, there are still companies that need to make payroll next week and they are going to take night work when pressed by the customers,” he said. A company owner said his perspective over the years regarding night climbing has changed. Oftentimes night work is performed, not because it is a carrier’s cutover or maintenance requirement, it’s because of the need to finish the assigned task at the end of the day. “Today, pricing is whittled to the bone and there’s the underlying directive to get the job done in a timeframe that requires night work,” a foreman informed Wireless Estimator. “My PM tells me we have to be at another job site the next day, and even if he doesn’t say it, the pressure is on since the company doesn’t want to see another day’s per diem on the same site,” he said. The Jan. 10 fatality occurred at about 8:44 p.m. It was tiger team work, but it is not known if the three-man crew was working during nighttime hours to complete a project that was started earlier in the day or if it was carrier-required nighttime work. “I personally feel that nighttime climbs are for the most part unnecessary. That being said, they have to be approached with particular focus on the hazard itself which is the lack of light. You can properly gear up and accomplish night work safely if the pre-climb hazard assessment and proper planning are in place,” said John Paul Jones, President of Tower & Turbine Technologies. “A carrier’s sector antenna repair weighs in further down on the scale than a FirstNet outage or critical public safety communications infrastructure repair needs. During the dark months in Alaska, companies perform climbs in no or low light conditions on a daily basis without incident. If the contractor does not have the training or is not experienced in this type of work and does not have the proper equipment to perform the work safely, then they should always decline the work,” Jones said. Nighttime work is permissible, according to OSHA, as long as the employer provides a safe working environment for its employees – a catchall nebulous requirement that provides little, if any guidance. 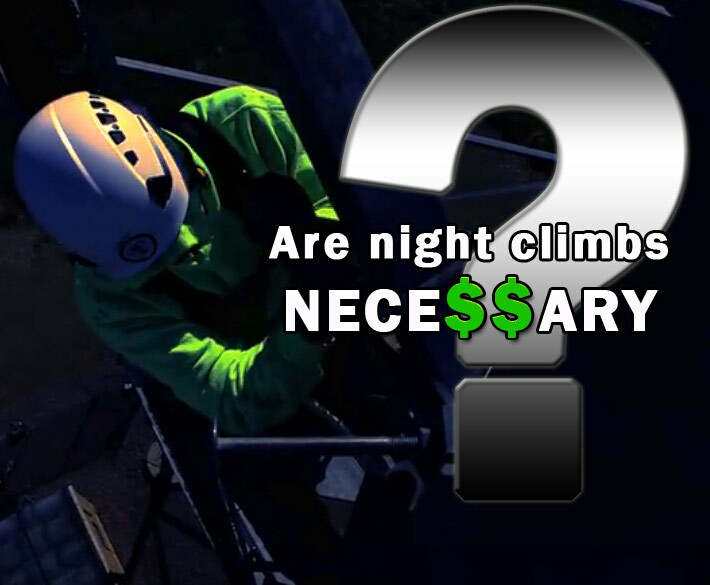 The National Association of Tower Erectors (NATE) addressed night climbing in in a 2016 safety video, which was the first time that the industry focused upon the task’s inherent dangers and the need to establish a method of procedure and an overriding requirement to visit the site during the day. They said the key element is prep time, a window that isn’t always provided due to ambitious client time and budgetary considerations. It is expected that during the NATE UNITE 2019 annual conference in Grapevine, Tex. starting Feb. 4, night climbing will be an important topic during committee meetings. As shown in the past, NATE’s subject matter expert committees can play a role in developing future best practice resources on the subject of night tower work so that carriers, tower owners, contractors and technicians can all become more educated on the issue. It is not known if night climbing will be addressed in the next revision of industry consensus standard ANSI/ASSE A10.48, Criteria for Safety Practices with the Construction, Demolition, Modification and Maintenance of Communication Structures. The State of Washington, in its Chapter 296-32 Safety Standards for Telecommunications, addresses Work during hours of darkness, but it only states: “Climbing towers in the hours of darkness shall only be done after the job hazard assessment has addressed any additional hazards.” The Department of Labor and Industries (DOSH) states that hours of darkness means one-half hour before sunset to one-half hour after sunrise. The unanswered question is whether DOSH or OSHA could cite a contractor if the contractor identified appreciable hazards in their job hazard analysis due to nighttime work which could have been abated by performing the work during daytime hours if it wasn’t emergency restoration work. OSHA provides suggested guidance on extended unusual work shifts, but it doesn’t address the inherent dangers of working on a tower at night.